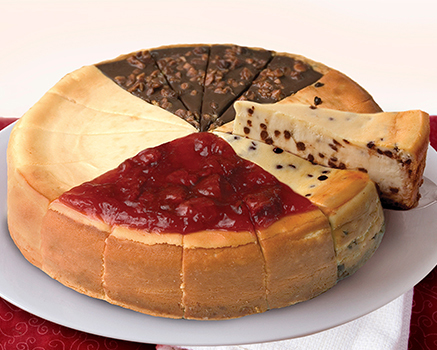 A no sugar added version of our Original cheesecake, baked on a graham crust, made with Equal® Sweetener. Eli's No Sugar Added Cheesecake contains 27% less sugar than our Original Plain Cheesecake (Compared to an equal size slice of Original Plain Cheesecake). Ingredients: Cream Cheese (Pasteurized Milk and Cream, Cheese Culture, Salt, Carob Bean Gum, Guar Gum), Maltodextrin, Sugar Free Graham Crumb [Enriched Flour ( Wheat Flour, Niacin, Reduced Iron, Thiamine Mononitrate, Riboflavin, Folic Acid), Whole Wheat and Graham Flour, Soybean and Palm Oils, Maltodextrin, Sodium Bicarbonate, Salt, Sucralose], Egg, Sour Cream (Cultured Nonfat Milk and Cream, Corn Starch, Whey, Guar Gum, Carrageenan, Carob Bean Gum, Enzymes), Butter (Cream, Salt), Equal Sweetener (Maltodextrin, Aspartame), Modified Corn Starch, Enriched and Bleached Flour (Bleached Wheat Flour, Malted Barley Flour, Niacin, Reduced Iron, Thiamine Mononitrate, Riboflavin, Folic Acid), Egg Whites, Vanilla Extract, Stabilizer (Xanthan Gum, Locust Bean Gum, Guar Gum), Salt, Soy Lecithin.